Look out MADISON – Dane County region! We are coming for you! Are you a REALTOR that would like to add Home Staging as a key listing service and learn how to get every seller to say “YES” to Staging? Or are you a person that would like to be a professional Home Stager and learn how to earn income from your creative talent? 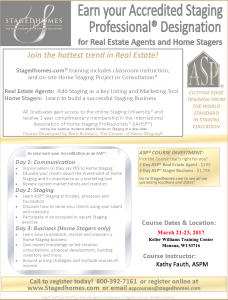 Sign up NOW for the Accredited Staging Professional (ASP) Course – MAR 21-23 – and earn the highest form of training in the industry! REALTORS – earn 14 CE Credits for attendance MAR 21-22. Go to REGISTER FOR THE MADISON ASP COURSE to register and make sure to look for any special discounts off your tuition. You can also call 800-392-7161 and speak to the Stagedhomes.com team!